I am Ross McCurdy, Science Teacher at Ponaganset High School in Rhode Island where I teach Science and Alternative Energy Classes. This Gofundme.com page will help raise the funds needed to achieve the Coast to Coast Bioflight. This will be a Coast to Coast flight from Rhode Island to Santa Monica, California using aviation biofuel made from renewable Camelina plant seed oil. This will be the first Transcontinental flight using biofuel in a certified light aircraft and will promote renewable energy and sustainability through the excitment of aviation. The benefits of this renewable aviation biofuel include lower emissions, made in America, and a significantly lower Carbon footprint. The goals of the Bioflight are to promote Aviation, Renewable Energy, and real world Science Education. We will be flying a single engine Cessna 182 equipped with an amazingly fuel efficient SMA aviation diesel able to run on the aviation biofuel. Improving energy efficiency and using renewable energy are two great ways to help protect and improve our environment. Joining me on the Bioflight will be my 12 year old son Aedan McCurdy, who is very enthusiastic about flying and renewable energy. Fellow Paramus Flying Club member and friend Tomoharu Nishino will join us from Rhode Island to Dayton, Ohio and another pilot friend Thierry Saint Loup, with SMA Aviation Diesel Engines, will be flying with us from Texas to California. Along the way we look forward to meeting people and spreading the word about renewable energy. Our trip will include a visit to a Science and Technology school in Mesa, Arizona to talk with students about Aviation and Renewable Energy and Bioflight information will be shared through the www.bioplane.us website and social media. Of course the Bioflight will also be used to teach our students here at Ponaganset High School in Rhode Island. The Coast to Coast Bioflight is scheduled to take off very soon, on Saturday April 16th 2016, the birthday of aviation pioneer Wilbur Wright. The funds will be used to cover the cost of flying the Cessna 182 Bioplane for the 5,000 mile round trip to California and back. This means a tremendous amount to me as years of work and thousands in personal expenses have gone into preparing for the Bioflight, and we are almost ready to take off. The aviation biofuel necessary to achieve the flight is now in place at the airports along the route and the Bioplane is ready. Now we need your support for the home stretch to help us achieve this milestone flight and demonstrate the power of renewable energy. Your help is deeply appreciated and I am immensely thankful for your support. It has been about a year and half since we completed the Coast to Coast Bioflight, flying over 5,000 miles round trip using aviation biofuel! Looking over my GoFundMe site and seeing the names of so many people who came together to support the Bioflight I am inspired and deeply moved. The people who made this flight possible included the FAA, US Air Force, Paramus Flying Club, my childhood friends, family, military buddies, members of the renewable energy community, pilot and aviation friends from around the country and around the world, and so many of my past and present students, their parents, and others in our Ponaganset High School community. A whole lot of people! I want to express my deepest thanks to all of you who believed our Coast to Coast Bioflight was achievable and made the flight possible. The entire round trip flight covered over 5,000 nautical miles (a nautical mile is 15% longer than the regular statute mile we use with cars) and logged over 50 hours of flying time. All of it using aviation biofuel blend made from Camelina plant seed oil that was supplied by the US Air Force. Thanks Air Force! I had the good fortune to have some of my pilot friends accompany Aedan and me on different legs of the flight. Tomoharu Nishino of Paramus Flying Club flew the initial leg from Rhode Island to Pennsylvania, Thierry Saint Loupe flew with us from Dallas to Santa Monica, and my former student Alex Schenck flew with us on the home stretch from Dayton to Rhode Island. Thanks for being on the team! We flew at altitudes ranging from a few thousand feet to 12,500 feet, just under the altitude where supplemental oxygen is required. We flew through weather ranging from clear blue skies to taking off into thick clouds with zero visibility. Seeing so much of our country from the air was exhilarating. The plains of the MidWest, the winding Mississippi River, the Texas deserts, the seemingly endless wind turbines near Palm Springs, and the Hollywood Hills were all breathtaking sights. Thank you for making this possible! While this was the first round trip Transcontinental Bioflight it did not meet the criteria for an official World Record with the National Aeronautic Association (NAA) or the Fédération Aéronautique Internationale (FAI). Official World Records exist in the categories of distance, speed, altitude, time to climb, greatest payload, and efficiency. It was time to set an Official World Record. On the morning of July 12th 2016 French Pilot Thierry Saint Loupe and I took off from Caldwell Airport in New Jersey in the Bioplane to set the World Record in fuel efficiency for our plane's weight class. Thierry is my friend and an experienced pilot who trained at Embry Riddle Aeronautic University and flew with Aedan and me on the Bioflight from Dallas to Santa Monica and back. Thierry is also the VP of SMA aviation diesel engines, the amazingly efficient aviation diesel engine we were flying in the Bioplane. Thanks to good tailwinds on the way back home from the Bioflight's California trip we had enough aviation biofuel left over to fill up the two tanks of the SMA Cessna 182 for the fuel efficiency flight. The rules to set a fuel efficiency record flight required the flight path to be a triangle, a very large triangle. Our flight plan was 848 nautical miles from Caldwell, New Jersey to Buffalo, New York to Portland, Maine and back to Caldwell, New Jersey. No refueling or stops allowed. We flew high at 12,500 feet for maximum efficiency, set the controls to achieve the best possible fuel economy, and mentally prepared ourselves for a very long flight with no bathroom breaks. For much of the flight we were above the clouds with occasional glimpses of the ground as we flew by the Great Lakes and towards the Atlantic Ocean. Being careful to fly around the airports of Buffalo and Portland as cutting corners would disqualify our flight, we continued our flight path back to Caldwell to finish our giant sky triangle. As with the Coast to Coast Bioflight, the aviation biofuel performed perfectly in the Bioplane's SMA aviation diesel and with the towering skyline of Manhattan in view we landed back at Caldwell Airport. The 848 nm flight took 9 hours and 6 minutes using only 56 gallons of aviation biofuel, setting an Official World Record with the NAA and FAI for fuel efficiency! I want to thank all of you who made the Coast to Coast Bioflight and fuel efficiency World Record Bioflight possible. Thanks for believing in us and your help in demonstrating renewable energy and promoting a cleaner, sustainable future for all of us. I want to wish all of you and your families a Wonderful Holiday Season. My son Aedan and I want to thank everyone who helped make the Coast to Coast Bioflight possible. 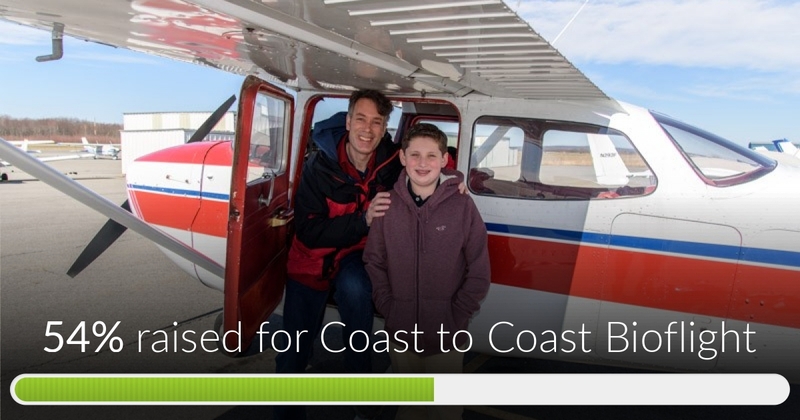 With your help we flew Coast to Coast, from KSFZ in Rhode Island to Santa Monica Airport in California, and back, using the aviation biofuel blend. Over 5,000 nautical miles! Over the entire flight the aviation biofuel performed perfectly in the SMA aviation diesel engine and we flew as high as 12,500 feet. The longest non stop section of the flight was 750 nm from Dallas to Dayton. With a favorable tailwind helping us we made that distance in just over 5 hours. We landed safely back at KSFZ North Central State Airport in Rhode Island on Monday April 25th 5:22 pm to a warm reception of family, friends, and local tv news to report the flight. 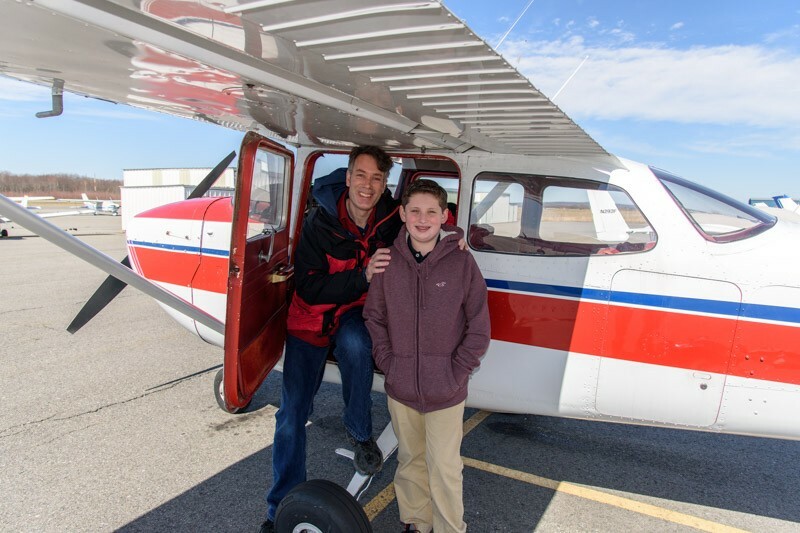 Aedan and I flew the Bioplane back to the Paramus Flying Club home base of Caldwell Airport in New Jersey on Wednesday April 27th completing the biofueled journey. Over the course of the flight we were delayed by some rough weather in the Texas area, flew through low clouds on an instrument flight plan out of Arkadelphia, Arkansas, saw amazing Western mountains and flew by the Hollywood sign and the beautiful California beaches. We met great people at every stop and it was an amazing trip. This Saturday April 16th is take off day from North Central State Airport in Rhode Island and Coming up fast! First stop will be State College, Pennsylvania to top off with biofuel and meet people. Next stop Moraine Airpark in Dayton, Ohio where we will stay overnight. It will be great to be in Dayton for Wilbur Wright's Birthday! Thank you for all your help with the Bioflight. The outpouring of support is absolutely inspiring! Coast to Coast Bioflight has reached 54% of its goal! Thanks to everyone who has helped Bioflight get this far! Please share this to get the word out and make it to the home stretch. The support and positive response has been amazing and you have my most sincere appreciation. Wishing you and the entire Coast to Coast crew the best of luck and good tailwinds. Your years of efforts are finally coming to fruition and will help to inspire and educate so many, especially our students. Have FUN!! Which school in Mesa are you visiting? I'm in Phoenix! This is absolutely amazing! Good luck out there, Mr.McCurdy! I wish I could join you again on this amazing trip ! So proud of you and all the amazing things you are doing! Keep it up!